She was the size of a pen when she was born and weighed less than a pound at just 420 g. But the tiniest miracle born in Ireland Sive McDonald is home now, thriving with her parents. Aisling McDonald and her husband, John met in Australia and were married in Ireland, where they were both raised. When Aisling was expecting the couple’s first child this summer, they were naturally very happy. But doctors were a bit worried with Aisling’s condition during pregnancy because she was continuously suffering from high blood pressure. Her body was under pressure and doctors feared her life was in danger and could have a stroke. The doctors also told him that they were doing the best they could for the baby but the mother was the priority. 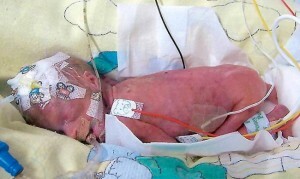 Finally, on June 11 baby Sive was born 16 weeks early smaller than the palms of her dad’s hand. The medics already gave ‘no hope’ for the baby. Aisling and John had just become parents to a premature baby and admit that initially they were ‘naïve’. Dr. Paul McMahon the doctor who was looking after baby Sive had another problem. He could not see the microscopic veins of the tiny child. Finally he got specially ordered spectacles from the US to locate the veins. Her thankful parents are now sharing their story to remind other parents of preemies to be hopeful.